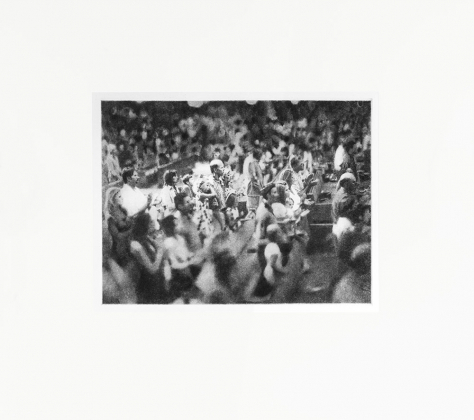 For this Limited Edition print, Forster has taken his highly detailed drawing of a congregation clapping through the photogravure etching process to create a new image which is similar, but different to the original. The drawing itself originated from a photograph found in an old National Geographic magazine. By taking the image from the printed page to a one off and then back to a reproduction, Forster elicits a new work. Richard Forster lives and works in Saltburn, Cleveland UK and is represented by MOT International. In 2006 he was awarded a Jerwood Artists’ Platform with a solo exhibition at Cell Project Space, London. Recent group shows include, Opposite of Vertigo, Drawing Room, London; New Art on View, New Art Gallery Walsall; Daisychain, MOT; Blue Star Red Wedge, Glasgow International; Lounge II, MIMA and The (Ideal) Home Show, Gimpel Fils Gallery, London. His work is in over sixteen prominent collections, both private and public.